Get ready for PrayerWeek Jan 2018! When the disciples saw Jesus pray they wanted to pray like him and they asked him to teach them how to do it. Whether you've been praying for years or are just starting out why not start PrayerWeek by saying to Jesus 'teach me how to pray.' Many of us want to start the year getting more healthy and increasing how much we exercise, how about we start 2018 by asking the Holy Spirit to increase our appetites for prayer. As Rob Scott Cook often says, "Prayer is key for releasing God's purposes in our lives, church and city." I'm excited to think of so many of us praying this week for Gods plans and purposes to be revealed. 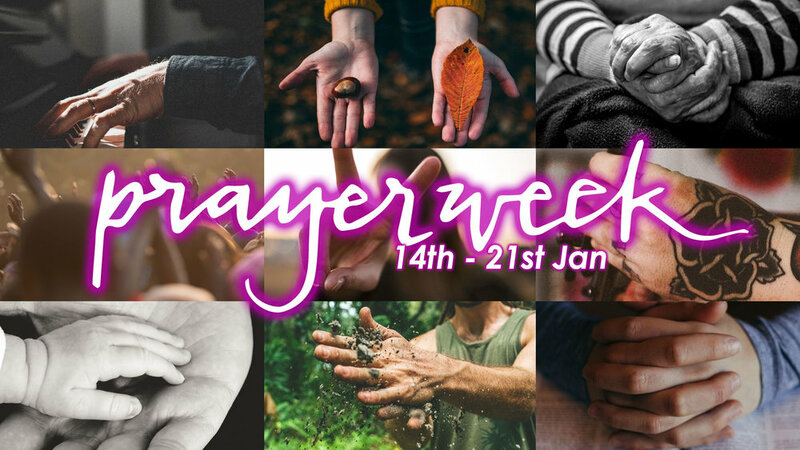 It's not just Woodies who will be having a focus on prayer this week, all of our congregations in Woodlands Group of Churches are spending this week praying. That's a lot of prayer. Exciting! To help us pray for our churches across the city, every day we will be posting on social media and emailing out a message from each church with some requests for prayer. We would love it if you could take some time each day to pray for each of our churches and bless them. When the disciples asked for Jesus help with prayer he replied by teaching them what we now call the Lord's Prayer in Matthew 6 . It's a great framework for prayer, but it's also a great prayer to pray. We're suggesting that every day this week you take some time to pray the Lord's prayer at midday if your able, you could set an alarm to remind you. I'm so excited to think about hundreds of us scattered across the city wherever we might be pausing and praying the words that Jesus prayed 2000 years ago. Our 24/7 Prayer room will open on Sunday evening, it's always an amazing space to help you draw near to God, quieten your soul, experience His peace and pray for our church, city and world. If you have never visited it before I'd especially love you book a slot, your hour will fly by! Book in for the Woodlands Church 24/7 Prayer Room here. It's also a week for us to pray together as church family, there are 3 opportunities and everyone's welcome. Why not come with your small group/pastorate? PrayerWatch PM Mon 15th, 7.30pm in the Main Hall. Where we will pray and worship together. PrayerWatch AM Fri 19th, 7.15-8.15 am in the Foyer, pop in on your way to work. 'Space' Fri 19th at 10pm-12am in Main Hall. Worship & prayer event hosted by the worship team. and 'Family Prayer Space' on Sat 20th, organised by Woodlands Children's Church. If you not sure where to start with prayer, check out these top tips to get you started! Also we are using the PrayerMate app, so check out our PrayerMate prayer-list which you can download from your phones app store - it's a helpful way to keep track of what your praying for and Woodies will be posting some items for prayer on the app. James 4:8 says, "Draw near to God and he will draw near to you...." As we pray lets expect God to speak, he is our loving Father who loves to communicate with his children. If you have any prophetic words, pictures, encouragements you wish to share with the Woodies team you can email them to prayerweek@woodlandschurch.net we'd love to hear them. Look out for more details coming out soon, have a great prayer week! Book in for the Woodlands Church 24/7 Prayer Room here. Don't forget PrayerWatch AM meets for this month on Fri 19th not the 12th.